Here's a copy of our objection to application 17/1008/F by the Borough Council of King's Lynn and West Norfolk to itself to move the bus gate north, remove the restrictions south of there and add three turnings off Harding's Way. It's a bit long but that's because the plan seems to contradict so many policies, past promises and precedents. Please add your own objection today (Thu/Fri 27/28 July 2017) by going to www.west-norfolk.gov.uk/planning and typing the reference 17/1008/F into the search box, then "Make a Comment" and fill it out. It doesn't need to be as long as this one, but you might like to comment on which policy breaches most offend you! We object to this plan because it is clearly contrary to borough, county and national planning policies, as well as contrary to past assurances from both councils, plus it is completely unnecessary and it endangers road users. There is also a fundamental democratic problem with this proposal in that it directly contradicts statements made at various council meetings over at least the last decade (including as recently as the Borough Council Regeneration and Environment Panel of June 2017) that Harding's Way was not to be used as a through route and that HGVs would never go on it. Using a "safe route to school" for "max legal HGV movements" seems a negligent idea and is clearly contrary to many planning policies, including Borough Core Strategy policies CS03 ("links within the town for walking and cycling will be maintained"), DM E1.5 and E1.10 (where good pedestrian and cycle routes are required for development of this area - adding HGVs clearly devalues this as a valid link for users such as children), CS08 ("good access links for walking and cycling" - clearly making an existing link be crossed by more HGVs is the opposite of providing a good one), CS11 (where the strategic cycling network is meant to be developed, not impaired), CS14 (this development does not provide any new walking or cycling links) and even DM E2.1 (because Harding's Way is part of the growth area's main cycle link to the town centre). At county level, it seems contrary to Local Transport Plan policies 9 Travel Choice (because it is downgrading a walking and cycling route to town), 12 Tackling Poor Accessibility, 13 Access to Town and Urban Centres, 11 Reducing Casualties (because it is adding HGV traffic to a cycle route and we know HGVs are disproportionately dangerous to cyclists) and 14 Sustainable Tourism and Leisure. 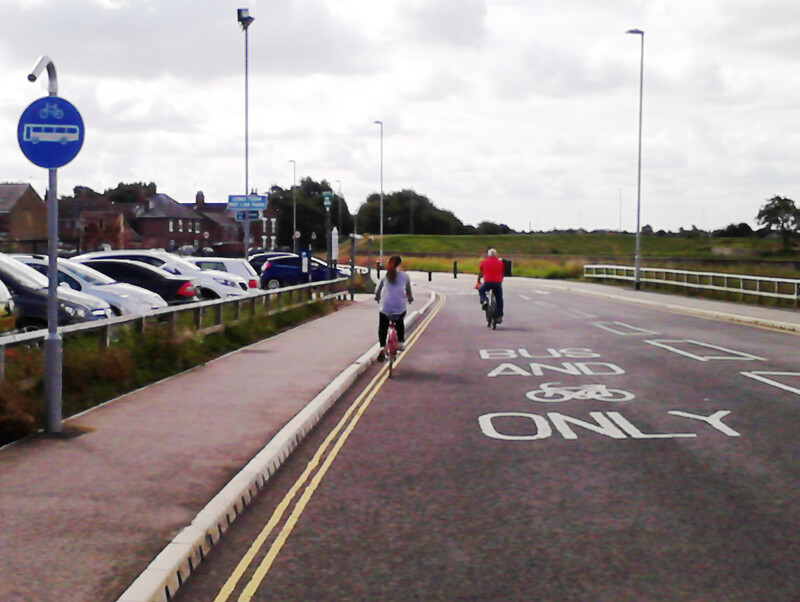 It is also contrary to the Norfolk Cycling and Walking Action Plan points 6.1 ("use full segregation on the main cycle routes [...] in urban areas") and 6.9 ("new developments are designed to encourage people to cycle and walk."). On casualty reduction: the questionable car park accesses near the northern end of Harding's Way already provide far too much conflict and frequent near-misses between motorists who fail to look south before pulling out and cyclists and buses legitimately using Harding's Way. 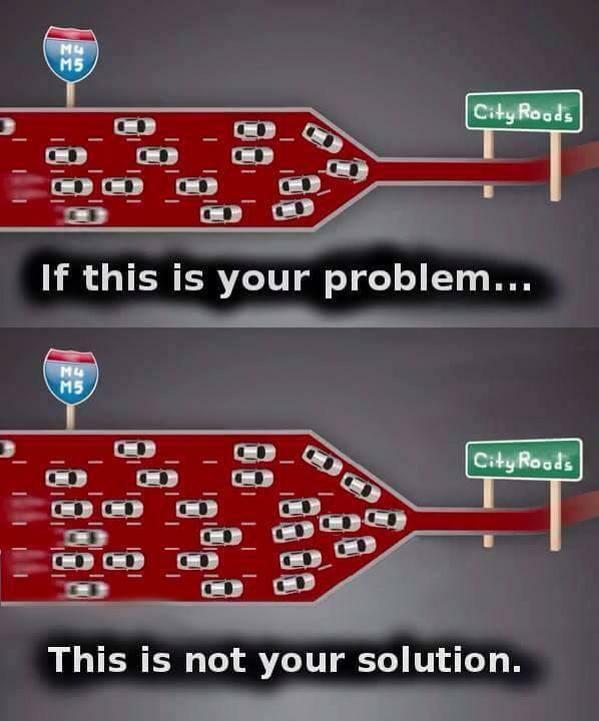 It is astounding to propose adding similar accesses but with far larger and more deadly vehicles to the southern end. This intensification of an existing junction and addition of further junctions is also particularly disappointing for this location because South Lynn was the second-worst electoral division in Norfolk for road casualties, according to the last Norfolk Insight Health and Wellbeing Profile we have which shows the ranking (2013). County council policies are also responsible for public health and this proposed development is contrary to Public Health guidance PH8 on Physical Activity and the Environment, especially its Recommendation 2 to re-allocate road space to support physically active modes of transport, restrict motor vehicle access and create safe routes to schools. At national level, it is contrary to NPPF core planning principle paragraph 17 'actively manage patterns of growth to make the fullest possible use of public transport, walking and cycling', 29 "The transport system needs to be balanced in favour of sustainable transport modes," and paragraph 35 'give priority to pedestrian and cycle movements [and] to create safe and secure layouts which minimise conflicts between traffic and cyclists or pedestrians'. The proposed development would introduce new conflicts between motor traffic and cyclists and pedestrians, as well as fail to make the fullest possible use. It is also contrary to NPPF paragraphs 109 (you should be "preventing both new and existing development from contributing to or being put at unacceptable risk from, or being adversely affected by unacceptable levels of soil, air, water or noise pollution or land instability") and 124 ("Planning policies should sustain compliance with and contribute towards EU limit values or national objectives for pollutants") which is also the paragraph which makes the borough Air Quality Action Plan a valid planning consideration. This application acts directly contrary to the Air Quality Action Plan measure "Improved cycling and walking provision" by downgrading existing provision. More generally, I agree with those who are predicting a negative impact on the air quality of the town centre area from the likely reduced cycling and walking if general traffic is allowed onto any part of Harding's Way. I also join the Civic Society and others in objecting to the absence of the Environmental Impact Assessment. In addition, I ask you to seek a transport assessment and draft travel plans for the sites served by the three access points, to inform your decision. I suspect permission would not be given for any of the developments if they required a new access from Harding's Way and so applying for the access stubs without considering the transport impact of the developments seems like an attempt to subvert the planning controls. Neither parcel of Borough owned land needs access from Harding's Way because both abut other highways, while the industrial yards have existing access. Planning application 16/01565/FM was withdrawn following negative statutory consultee comments about the impact of increased activations of the Wisbech Road / Harding's Way signals - surely an application for a move that implies an even greater number of activations of that arm (both entries and exits) should be subject to the same negative view? At a technical level, the corner radii and kerbs are simply inappropriate and dangerous for the crossings, allowing small vehicles to turn at extreme speeds and present a hazard to anyone walking and cycling across the junction mouth. The radii should be very tight and no kerbs should be used. While I can understand the desire to facilitate refuse vehicle movements, the low traffic and wide width of Harding's Way means that the vehicle could swing a wider arc than normal if needed. The junction crossing priorities are old-fashioned and inappropriate for this location, so must be reversed to give people cycling and walking priority, with the give-way markings to the outside of the footway. This opportunity should be taken to remove the punitive (and frequently bypassed) stagger from the crossing of the Harding's Way exit and reconfigure the signals to incorporate a so-called "Barnes' Dance" all-arms crossing phase. There is no crossing shown from near the northern end of the proposed new eastern footway to the western footway, nor even any flush kerb for wheelchair/mobility scooter users to access the western footway. It seems a bare-minimum compliance with the county council officer suggestion, rather than a well-designed decent provision. A "proposed footway widening" is shown on the eastern side where there is current only a grass verge and no footway - how can you widen something which is not yet there? As an absolute minimum, the eastern footway should continue northwards to a zebra crossing. Has the designer actually visited the site to see what's there and how it is used? 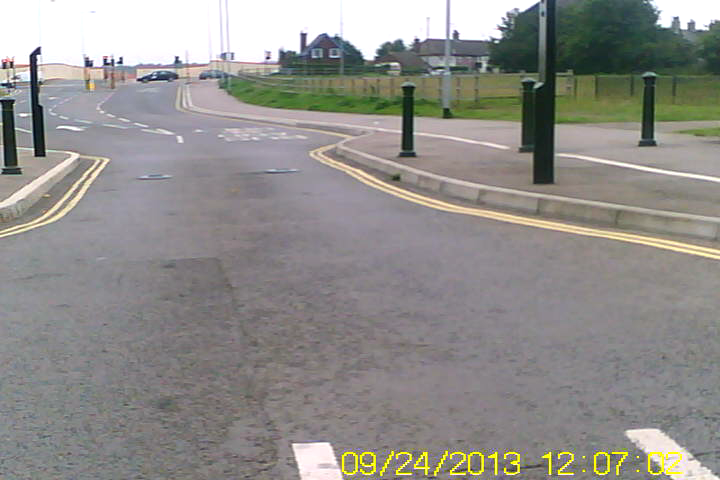 And at a practical level, the removal of the "BUS AND [CYCLE] ONLY" markings from Wisbech Road and the mouth of the cycle route will surely increase the number of motorists turning into the road mistakenly, especially when following sat navs that still don't recognise this turning correctly. In the frequently-occurring situation of the bollards being in the down position, a number of these motorists will continue northbound, where they pose a danger to users of National Cycle Route 1, the Nar Valley Way, school children and the historic Whitefriars' Gate, especially if the northern bollards are operating correctly and vehicles perform turns near the gate and school. As an absolute minimum, a "BUS AND [CYCLE] ONLY AHEAD" marking should be placed in all existing locations. I urge you to query why the drawing appears to show "Proposed Fencing" across the road between the proposed new southernmost eastern and western accesses, plus along most of the western footway including across the entrance to Harding's Pits Community Garden. Has the drawing key been mislabelled? Finally, I note with disappointment that the borough council insults the Harding's Pits Community Association and William Derisley Harding by referring to the area as "Hardy's Pits" on the e-planning site. I urge you to reject this application which falls far below the required standard and fails to comply with far too many policies as well as past promises. If you approve this application, what worth will be left in any assurances from the councils or any of the policies about planning or public health matters?